An unaltered photocopy of your DD-214, OR WD AGO 53-55, OR other military issued document clearly displaying your Meritorious Service Medal award or eligibility. The Meritorious Service Medal was established by Executive Order 11448, signed by President Lyndon B. Johnson on January 16, 1969. 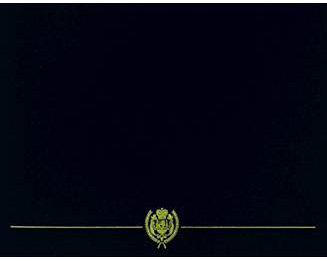 The Meritorious Service Medal has been in effect since January 16, 1969. The Meritorious Service Medal may be awarded to members of the Armed Forces who distinguish themselves by outstanding noncombat achievement or by meritorious service to the United States, but not of a degree that would warrant the award of the Legion of Merit. The Meritorious Service Medal is worn after the Defense Meritorious Service Medal and before the Air Medal. Additional awards are denoted by gold stars. For the Coast Guard, the Operational Distinguishing Device may be awarded. 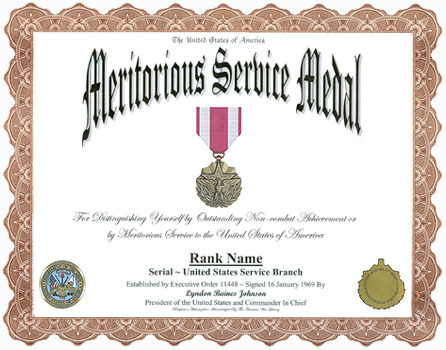 The Meritorious Service Medal was designed by Jay Morris and sculpted by Lewis J. King, Jr., both of the Army's Institute of Heraldry. The first recipient of the Meritorious Service Medal was Commander Frank W. Hannegan, USN, (March 27, 1969). A bronze medal one and a half inches in diameter overall consisting of six rays issuant from the upper three points of a five-pointed star with beveled edges and containing two smaller stars defined by incised outlines. In front of the lower part of the medal there is an eagle with its wings displayed. It is standing on two upward curving branches of laurel tied with a ribbon between the eagle's feet. The eagle, symbol of the nation, stands on laurel branches denoting achievement. The star is used to represent the military service and the rays emanating therefrom denote the constant efforts of individuals to achieve through excellent and meritorious service. The reverse is blank except for a circle consisting of the raised inscription, UNITED STATES OF AMERICA (at the top) and MERITORIOUS SERVICE (at the bottom). The two portions of the inscription are separated by bullets, and the space inside the circle is to be used for engraving the recipient's name. The ribbon is ruby red with two white stripes, just inside each edge. The ribbon was suggested by that of the Legion of Merit. 1. Description: A bronze medal, 1 1/2 inches in diameter overall, consisting of six rays issuant from the upper three points of a five-pointed star with beveled edges and containing two smaller stars defined by incised outlines; in front of the lower part of the star an eagle with wings upraised standing upon two upward curving branches of laurel tied with a ribbon between the feet of the eagle. The reverse has the encircled inscriptions "UNITED STATES OF AMERICA" and "MERITORIOUS SERVICE". 2. Ribbon: The ribbon is 1 3/8 inches wide and consists of the following stripes: 1/8 inch Crimson 67112; 1/4 inch White 67101; center 5/8 inch Crimson; 1/4 inch White; and 1/8 inch Crimson. 3. Criteria: Awarded to members of the Armed Forces of the United States who distinguished themselves by outstanding non-combat meritorious achievement or service to the United States subsequent to 16 January 1969. Normally, the acts or services rendered must be comparable to that required for the Legion of Merit but in a duty of lesser though considerable responsibility. a. Decoration set (regular size): MIL-D-3943/66. NSN 8455-00-450-3728. Display medal NSN 8455-00-439-2142.
b. Decoration (miniature size): MIL-D-3943/66. Not stocked. c. Ribbon: MIL-R-11589/172. NSN 8455-00-439-2143.
d. Lapel Button (metal replica of ribbon): MIL-L-11484/85. NSN 8455-00-439-2141. 5. Background: a. At Tri-Department Awards Conference, 5-6 February 1968, there was a discussion on the need for a third meritorious award to provide appropriate recognition for noncombat achievement or service comparable to the Bronze Star Medal for combat achievement or service. It was felt that the Legion of Merits prestige was slipping because it was being used with increasing frequency to reward service below Legion of Merit standard, but higher than that required for the Commendation Medal. b. A proposed executive order was prepared in April 1968 and forwarded for approval to the Military Departments. An ad hoc committee was formed by the Secretary of Defense (M&RA) to select a name. On 8 November 1968, the committee unanimously approved the name "Meritorious Service Medal". President Johnson established the Meritorious Service Medal per Executive Order No. 11448 dated 16 January 1969. The Executive Order was amended by President Reagan per Executive Order 12312, dated 2 July 1981, to authorize award to members of the armed forces of friendly foreign nations. c. The decoration was designed by Mr. Jay Morris, The Institute of Heraldry, and the design was approved by the committee on 20 March 1969. The ribbon design purposely follows the colors used for the Legion of Merit to reflect the parallel between the two medals. The eagle, symbol of the nation, stands on laurel branches denoting achievement. The star is used to represent the military service and the rays emanating therefrom denote the constant efforts of individuals to achieve through excellent and meritorious service. The provisions of Executive Order 11448 of Jan. 16, 1969, appear at 34 FR 915, 3 CFR, 1966 - 1970 Comp., p. 768, unless otherwise noted.